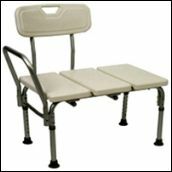 A shower transfer bench aids those with limited or disabled mobility in personal care when moving in and out of a bathtub or shower. 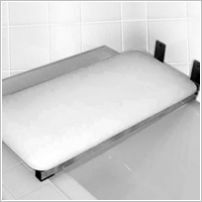 For those who are disabled or have limited or impaired mobility, shower transfer benches are effective, safe means of transitioning from one position to another. A shower transfer bench is a specifically designed device that assists the user in personal care requirements, such as moving into and out of a bathtub and assisting in getting over the bathtub curb. 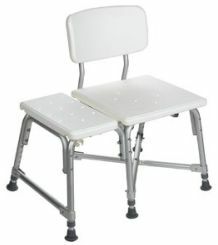 Other handicap transfer benches function as portable commodes, allowing the user to safely relief themselves, without having to struggle to gain access to a low toilet. Shower transfer benches are available in a wide variety of materials resistant to the effects of water. Ranging from teak, plastic and aluminum, these benches can support weight capacity of 300lbs and more. Heavy duty or bariatric transfer benches are capable of supporting weights over 300lbs. Transfer benches designed for use in the tub often offer swiveling, pivoting, and sliding seats, which gently and safely move the user into the bathing basin, without the fear of slipping, tripping, or falling. The advantage of a tub transfer bench is the longer lengths which extend from inside the tub out to the curb. A standard shower seat might not provide the additional space you required. Some benches attach to the bathtub wall while others are freestanding with non-slip feet. Customize your tub bench by adding a shower grab bar nearby to aid in standing and sitting. Handicap transfer benches are not limited to use inside. Many of these shower benches and seats are portable and can be taken outside for use in the garden, to alleviate the need for constant kneeling, shifting, and standing. The user can comfortably and securely remain seated while participating in gardening tasks. Loss of mobility is a frightening disability and the fears of falling and loss of independence can be overwhelming. Handicap transfer benches are one answer to this challenge, allowing the user to remain active and independent in their self care. Here are some of the best recommended shower and tub transfer benches to buy. Be sure to read the reviews for all of them. Bathtub Transfer Bench with Back – this transfer bench has wide seats for larger people. Adjustable Height Bath Transfer Bench – most affordable transfer bench that meets the needs of most users. Gray Padded Shower Transfer Bench – has a padded seat for those who need extra cushioning. Aluminum Frame Shower Transfer Bench – this is the transfer bench in the image above. This one is top rated by most users. Wider Extended Seat Transfer Bench – If you are a larger person and need a wide seating space along with a bench that can support heavy weights up to 550lbs, this is the best choice. Shower transfer benches have a wide range of choices and options for you to choose from. Depending on your physical needs and capabilities, some can run into the high hundreds of dollars or below $50. Prices range from $50 for a simple seat and can go up towards of $200 for sliding features and rails. Sliding transfer benches, where the bench is on some movable rails, will be more expensive. Extended shower benches that stretch pass the curtains and curbs will also add up in costs. Buying a shower transfer bench online is probably the simplest way to obtain one. Because you cannot touch the shower benches, you should take time to research the right product for you. Here are a few things to consider. Weight – With a support capability of up to 300lbs, the standard bench might be sufficient. Over 300lbs would require a bariatric transfer bench. Material – Choose the bench materials that fit your preference such as plastic, wood or metal. Size – Like weight support, size is equally important because the shower transfer bench must fit your tub or shower location. Widths that accommodate most tubs will be in the range of 17 to 24 inches. Other Options – Do you want a backrest or drain holes on the bench? Do you require safety rails on the sides? How high do you need this transfer bench? Additional options such as back support and suction cups on the feet that attach firmly to the bathtub or shower are also available.